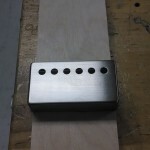 I’m going to show you how to make our standard nickel silver humbucker covers look like a real PAF cover from the 50′s. A lot of people don’t know this, but original PAF covers were dimpled around the polepiece holes where they got punched out. They were not flat like all covers made today. This is a small but relevant detail when it comes to looking like an authentic PAF. We had a customer ask if our covers were like this on our PAF Clones because he wanted to transform his Gibson R9 to be more vintage correct looking. He didn’t want to spend a fortune on pickups either just for a small detail. I explained we don’t make our PAF’s stock this way, but for a small upcharge it’s no problem. It’s simple to do and here’s how…. First I find a piece of hard wood that is thicker than the height of the cover. Here I found a piece of ply wood that is cut perfectly to fit the inside length of the cover. I just need to measure the width and cut a piece off. Now I sand the sides, corners, and edges until the wood block fits snug inside the cover. Not too tight, because it needs to come out easily. Once I get the fit right, I can trace the polepiece holes with a pencil on the top of the block. Using a drill press, I drill the holes on the block exactly where I traced them, trying to be as centered as possible with each hole. 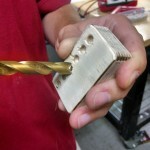 I use a bit that is slightly larger that the holes in the cover and drill into the block 1/2” or so by eye. It doesn’t have to be perfect. 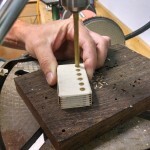 Once that is complete, I take a larger drill bit and lightly bevel the top edge of the holes in the wood block by hand. I want to keep the bevel even and round so my dimples on the covers are the same. Again this doesn’t need to be perfect. 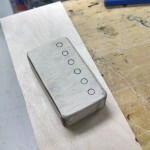 Next I install the block in the cover. 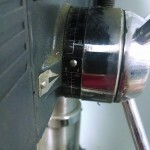 Then I install a steel rod that I ground into a beveled point into my drill press. You can use a large punch or something larger than the hole that bevels perfectly to a point. Whatever you use, it needs to fit into the drill press chuck and should be hard like steel. Here’s where you need to be critical. 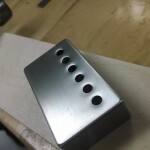 Every hole needs to look the same which means I need to press evenly on each hole of the cover with the punch. 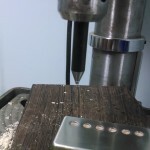 I press into the first hole where I want it and set my drill press stop. Now I can apply the same pressure on the other holes making every dimple the same. Here is the final outcome. You can see the slight dimple effect around the polepiece holes of the cover. Looks like a real deal PAF cover fresh off the punch. You should know what a real PAF cover looks like before doing this and practice on a scrap cover first, to get the technique down. Now time to dimple another cover, and then age them. That’s another topic for another time. Til then… thanks for viewing. This entry was posted in Technical, Uncategorized by david. Bookmark the permalink.